Brisbane has its fair share of amazing sunny days and at this time of year you just want to put on your ‘togs’, (that’s Queenslander for swimwear) and make your way to the nearest beach. Fortunately, you don’t have to venture far from Brisbane to find a stunning stretch of sand and blue waters. Here are our picks for the best beaches near Brisbane. For those looking for the best beaches in Brisbane you will quickly realise that there are none right in the city except for Streets Beach. Luckily, it’s a corker. This man-made beach sits on the Brisbane River and is completely free to visit, with beautiful white sand, calm water for swimming and barbecuing facilities for an enjoyable day out. Shorncliffe is about a 30-minute drive from the city centre, making it perfect for a daytrip. Walk along one of the longest recreational piers in Australia on Shorncliffe Pier, or relax with the family at Lower Moore Park with its kid-friendly paddling beach, excellent playground and nearby eateries. While you’re here, music fans should definitely check out the free Bee Gees Way nearby for a multimedia tribute to the harmonious crooners. Suttons Beach is a strong contender for one of the best beaches near Brisbane thanks to its patrolled areas, grassy areas and picnic and barbecue facilities. At a little over 40km from the city centre it’s a short trip that’s well worth your time. Spend a fun-filled day along the beach and promenade, following it up with some fresh fish and chips and an ice cream for dessert. Of course, the Gold Coast isn’t technically in Brisbane but it is very close at just an hour’s drive away. 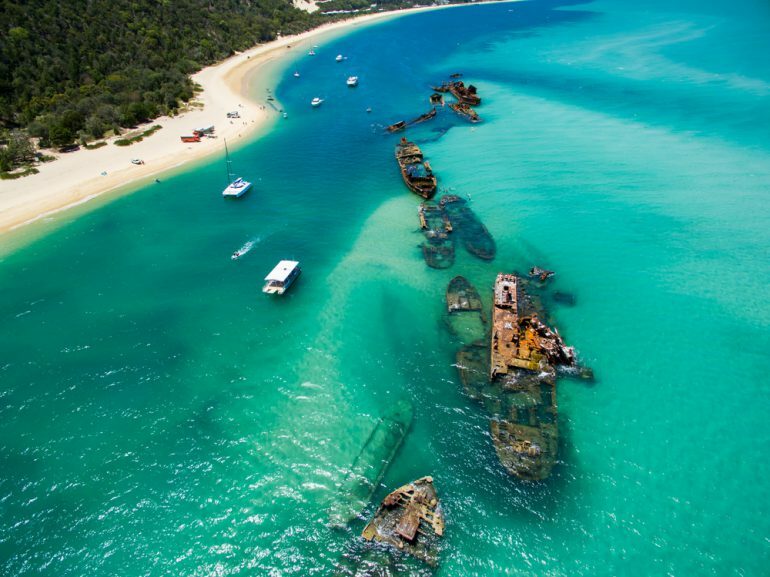 It also offers some of the most spectacular beaches in Australia. You can’t go very far without bumping into a white-sanded beach, and you’re never far away from markets and buzzing nightlife that the Gold Coast is famous for. Meriton Serviced Apartments offers opulent Brisbane family accommodation on Herschel Street and Adelaide Street, both providing stunning city and river views from your spacious suites. They make the perfect bases from which to explore Brisbane and surrounds and best of all, feature gorgeous swimming pools for you to take a dip without even leaving your accommodation. Now that’s relaxing!